Even though I am always completely tapped out by January 1st, I love this time of year! I haven't changed much since I stayed up half the night in high school hanging snowflakes all over my house to surprise my family. Though the holiday season can be stressful, there are lots of ways it can bring you joy and help you build community in your school. Here are six of the most successful ideas I've been part of over the years. Who doesn't love a pleasant surprise? Organizing a secret santa exchange among your students, teaching team, club participants, or players can bring everyone closer and add delight to December. This year I am doing it with my advisees, and I designed these cute Secret Santa slips for giving them partners. Download them free, print them out and fill in the names. Easy! I've done cookie exchanges with other faculty and with my student cooking club, and both were big successes. It's so fun to have dozens of kinds of cookies to eat and share over the holidays, but who wants to bake 30 kinds? Who has the time?! 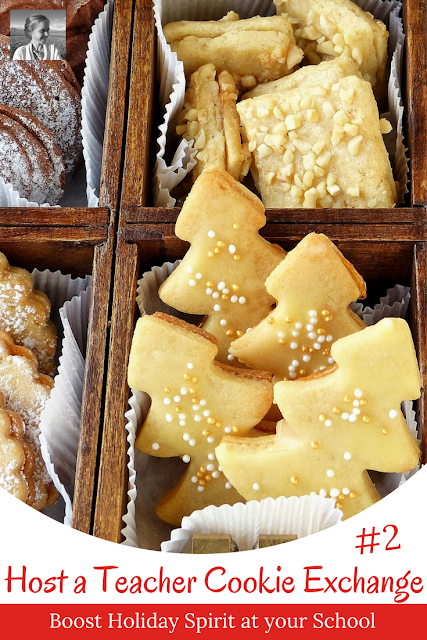 For a cookie exchange, just invite others to bring in one type of cookie (and lots of 'em!) and a big container to a get-together. Put on a little holiday music, add a bit of warm cider, and you've got a party! Everyone walks around and helps themselves to several of every cookie. December never tasted so good. Like so many English teachers, I love to read. And I love it when my students love to read. So it makes me happy, come December, to start promoting my winter break reading challenge. If students can get a BINGO on one of my winter break reading cards, I'll reward them with a prize when they get back. Talk up the challenge and the prizes during the month of December. Bringing in a shelf of library books you know they'll love doesn't hurt! 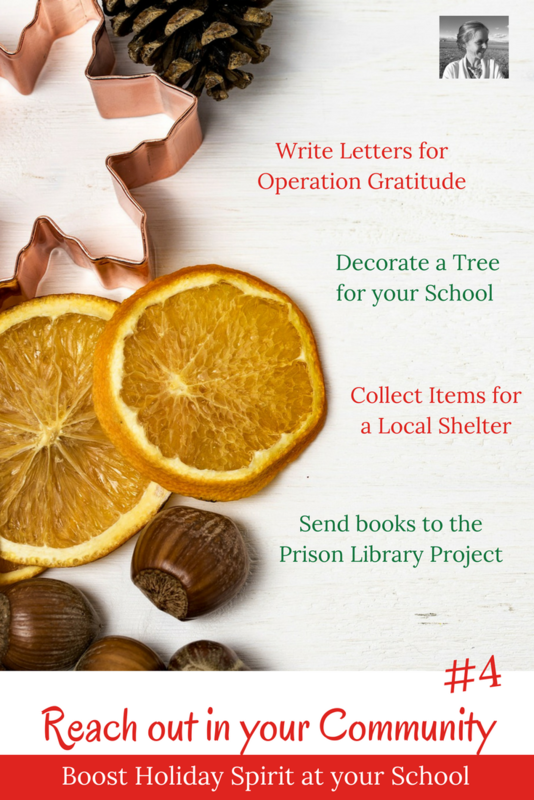 Help students give a gift of themselves this holiday season. Let them help you choose a project, whether it's collecting coats for a local homeless shelter, doing a book drive for the Prison Library Project, making ornaments for a surprise school tree you put up together by the front door, writing letters to deployed soldiers through Operation Gratitude, or some other initiative that is meaningful to your class. By helping others, you will also build a stronger bond with your students and your community. 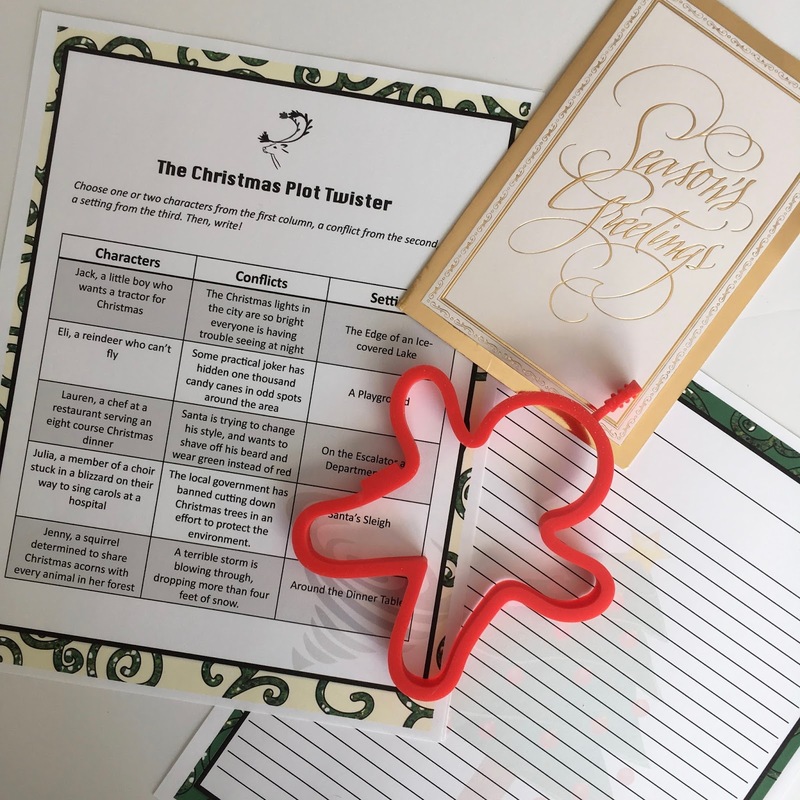 There's no reason you can't include a bit of holiday fun while learning what needs to be learned. Math students can do story problems about Christmas shopping and the amount of time it takes Santa to visit every house in a city, physics students can try to design gingerbread structures that support great weights, English students can write holiday stories, experiment with holiday sensory details, or practice writing holiday metaphors and similes. Whatever your discipline, it's easy to add a bit of cheer into a handout now and then. Once when I was coaching a long tennis match, one of my player's moms offered to grab Starbucks for me. I was so surprised! It was a small but lovely gesture. Last year I brought smoothies for all my son's preschool teachers on a ninety degree day, and it made me glad to be able to do a small thing to brighten their day. 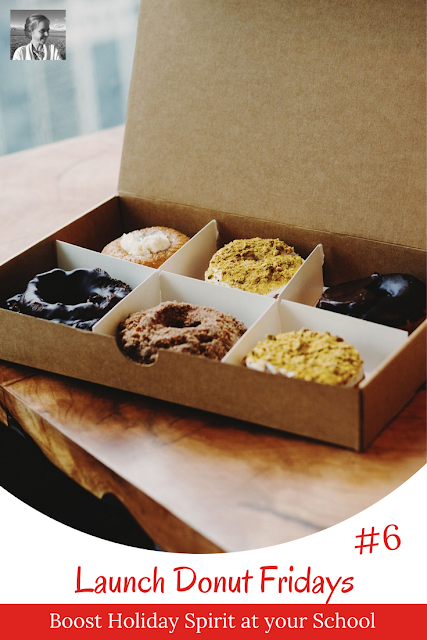 Maybe you can launch "Donut Fridays" for your teaching team or grab lattes for all on the way to work. You're spirits will get a lift when you see how happy you make everyone else. I hope this is a wonderful holiday season for you. If you haven't joined yet, this is a great time to hop into my growing Facebook group, Creative High School English. We'll be sharing all kinds of holiday fun over there. I am trying to infuse more holiday activities into my curriculum. Even as a secondary teacher I think this is important. Agreed! That's great! Happy Holidays! These are great ideas - I especially love the BINGO! Thanks for sharing!! Bingo has been fun with my students. I hope your like it too! Happy Holidays! Love! This is an AWESOME list. I am a huge fan of the eggnog latte, or white peppermint mocha. WAY more sugar than my usual drinks, but OH SO GOOD! Totally agree. We have Christmakkah (Christmas + Hannukah) at our house! Happy Holidays! I second the above comment about peppermint mocha! Yum ❤️ and I followed you on TPT as well! Great ideas! I will drink anything with caffeine! Happy Holidays! Mmmm... caffeine. You really can't go wrong. :) Happy holidays to you! We send Christmas cards, letters, and packages to deployed members of the military. We also take some Christmas cards to Veterans. That's so great! 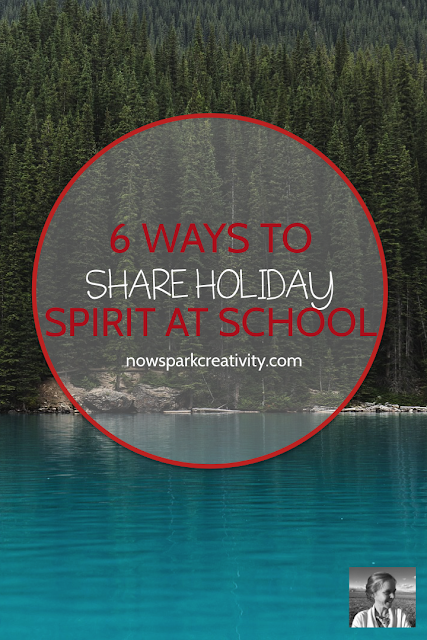 It's a great time of year to help students share their creativity and joyful spirits. Honeycomb latte sounds amazing! Happy Holidays! I followed your TPT store, and my favorite holiday coffee is gingerbread spice! I love gingerbread too. Happy holidays! Lucky they have tea and hot chocolate. Happy Holidays! My favorite holiday "coffee" is iced chai latte with 2 pumps of gingerbread syrup. DELICIOUS. Thanks for the great holiday ideas. I followed your store and FB page. Sounds amazing. Thanks for stopping by! Happy Holidays! I don't have a favorite "holiday" coffee since I tend to always just order the same thing, lol, a caramel macchiato with soy milk. Sounds good. :) Happy Holidays! Newest follower on your TPT store! Love your ideas and giveaways! My favorite holiday drink is peppermint mocha latte. Delish! Thanks! I'm so glad you hopped through! Happy Holidays. I am your newest follower! I love any kind of carmel coffee! Thanks so much! Caramel is awesome in any form. Happy holidays! Love your spirit of giving, have an incredible holiday season! I am a new follower! I don't like coffee too much! My husband says I have coffee with my vanilla cream and sweet and low! My favorite from Starbucks is a Vanilla Bean Frappuccino! I know what you mean. Good luck and happy holidays! I am a new follower: 322. Thank you for the chance to win! Glad you stopped by, Emily! Happy Holidays! I am follower number 323! I love peppermint mocha! Love these ideas! Great ways to get the kids involved. Thank you! I enjoy a Starbucks blonde roast! Good idea! I decided just to do it with a small group of kids (my advisees) to simplify, but it would be awesome class bonding if a lot of the kids wanted to do it. New Mexico Life, you are the winner!!! E-mail me at betsymork@gmail.com to claim your prize! Ooh Caribou Coffee. That reminds me of my Minnesota childhood. Now following your store, follower number 330! My favourite everyday drink is Vanilla Bean Frapp since I am not a heavy coffee drinker. I'm following on all platforms. I love coffee but am currently nursing so I choose to get decaf. My favorite drink is a decaf latte with skim milk. Hubby and I have been getting one a day since staying home with our newborn. It's kind of a nice treat each day. I'm nursing too and have been caffeine free for two years! Wow. Lucky there are lots of choices for us. :) I hope you and your family are having a wonderful holiday season! Thanks for the great ideas. My favourite starbucks drink is any type of frappe. I am following you. My favorite drink is the caramel frappuccino. Love it! I am now following you. My favorite holiday drink is a Peppermint Mocha. Definitely Gingerbread! Can't handle peppermint haha. I follow you on TpT as Kim H. I love hot chocolate. Many thanks for this opportunity. I followed your store. I love peppermint mocha! Following (#339) and I love hot chocolate! my favorite holiday drink is warm apple cider. I'm follower 365, and I really like the English Toffee Mocha because it is tasty and not too sweet. I wish you were part of my teaching team. 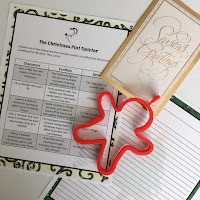 I love these inspirational (and simple) ways to spread holiday cheer and thanks this season. I am thankful you are part of this blog hop and for the wonderful suggestions you have shared. Hi Christa! That means so much to me. Thank you for telling me! I'm really glad you're here. I followed! This is a great post! My favorite coffee treat is a salted caramel mocha! I'm following! I love gingerbread lattes! These are super ideas...we did something like this in our district, but your ideas are brilliant. 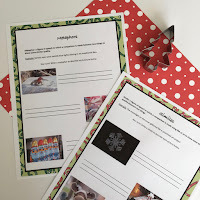 I am in the process of writing a similar blog, but more of the ideas are for the kiddos!! I'm following you now. I don't drink coffee, but I love caramel apple spice. I am #369. Any kind of coffee with cinnamon or caramel! Thank you and Happy Holidays!